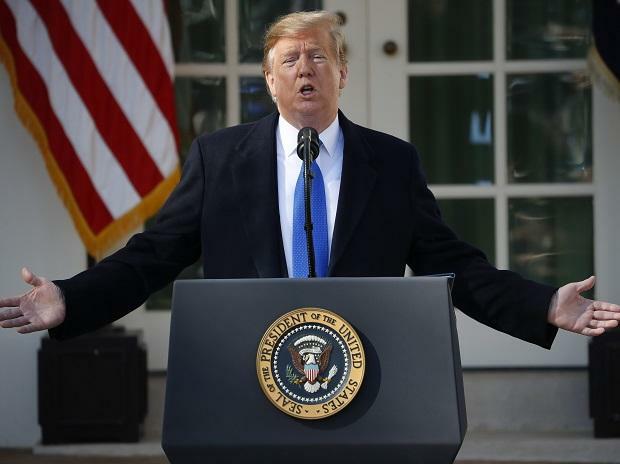 Battling with one branch of government and opening a new confrontation with another, President Donald Trump announced Friday he was declaring a national emergency to fulfill his pledge to construct a wall along the US-Mexico border. Trump made the announcement from the Rose Garden, as he claimed illegal immigration was "an invasion of our country." Trump's move followed a rare show of bipartisanship when lawmakers voted Thursday to fund large swaths of the government and avoid a repeat of this winter's debilitating five-week government shutdown. The money in the bill for border barriers, about $1.4 billion, is far below the $5.7 billion Trump insisted he needed and would finance just a quarter of the more than 322 kilometres he wanted this year. He said, "Sadly, we'll be sued and sadly it will go through a process and happily we'll win, I think." In an unusual joint statement, House Speaker Nancy Pelosi, D-Calif., and Senate Minority Leader Chuck Schumer, D-N.Y., called it an "unlawful declaration over a crisis that does not exist" and said it "does great violence to our Constitution and makes America less safe, stealing from urgently needed defense funds for the security of our military and our nation. " "The President's actions clearly violate the Congress's exclusive power of the purse, which our Founders enshrined in the Constitution," they said. "The Congress will defend our constitutional authorities in the Congress, in the Courts, and in the public, using every remedy available." Democratic state attorneys general said they'd consider legal action to block Trump. Puerto Rico Gov. Ricardo Rossello told the president on Twitter "we'll see you in court" if he made the declaration. Even if his emergency declaration withstands challenge, Trump is still billions of dollars short of his overall funding needed to build the wall as he promised in 2016. After two years of effort, Trump has not added any new border mileage; all of the construction so far has gone to replacing and repairing existing structures. Ground is expected to be broken in South Texas soon on the first new mileage.